Aiseesoft iPhone to Mac Transfer is specially designed for iPhone users to export iPhone music, movies, ringtones, camera roll, and pictures to Mac without losing anything. Also it allows you to backup iPhone files to iTunes, create, delete and edit iPhone/iPad/iPod playlist and its contents. What's more, it is highly compatible with iPhone 5s/5c, iPad mini 2, iPad Air and iOS 7, iTunes 11 after upgraded. Aiseesoft iPhone to Mac Transfer can easily transfer files (music, movies, ringtones, camera roll, and pictures) from iPhone to Mac local disk for backup. With this Aiseesoft iPhone to Mac Transfer, you are allowed to copy iPhone files to iTunes directly. You can create, delete and edit the playlist and its contents. Once connecting iPhone with your Mac, this iPhone to Mac Transfer can automatically identify the property of your devices: type, capacity (used and available space), version, serial number, and format. 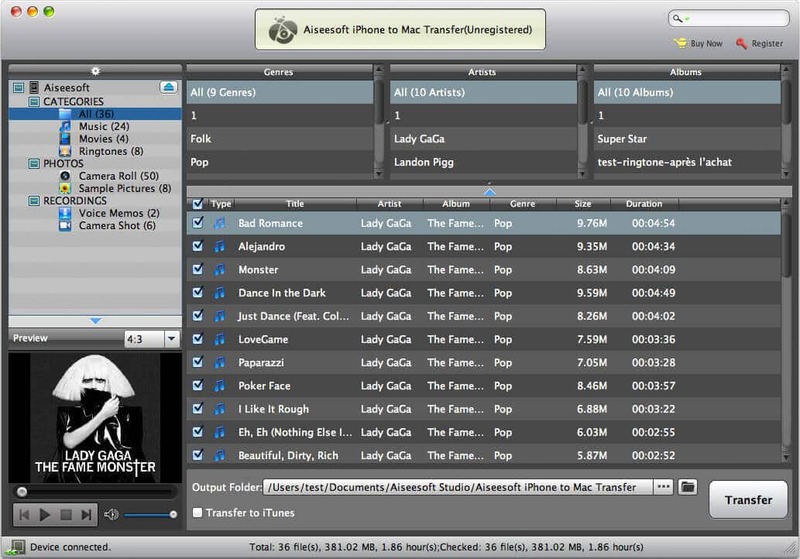 Aiseesoft iPhone to Mac Transfer can easily help find the files you want to transfer by Name/Album/Artist/Genre. Counting your selected files (succeed or failed transferred files) automatically is supported by this iPhone Mac Transfer.